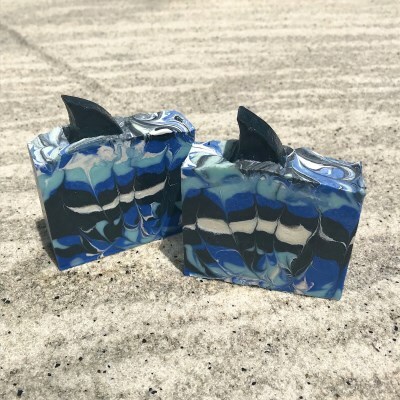 This bar is colored like an orca frolicking in the ocean waves, and it is topped with a black soap shark fin! It's scented with a blend of black raspberry and vanilla. The Orca Bar is made using the old-fashioned cold-process method that allows us to add extra skin soothing oils such as mango butter and shea butter. Your skin will love this bar! Approx. 4 oz. Ingredients: Saponified coconut, palm, olive, avocado, canola and castor oils; mango and cocoa butters; micas, titanium dioxide, and fragrance.